NETWORK FINALS: SWAT, SUPERSTORE, the 8:30PM AP BIO, and SCANDAL all lost 0.1 in final numbers. CABLE HIGHLIGHTS: FX’s ATLANTA returned strong at 0.44, not far below its 2016 series premiere at 0.53/0.48, and a tick above the Season 1 finale. It was also notably up from its 0.29 lead-in, the movie STRAIGHT OUTTA COMPTON. Thursday cable again had its Top 3 slots bookended by the NBA, this night on TNT at 0.77/0.52. 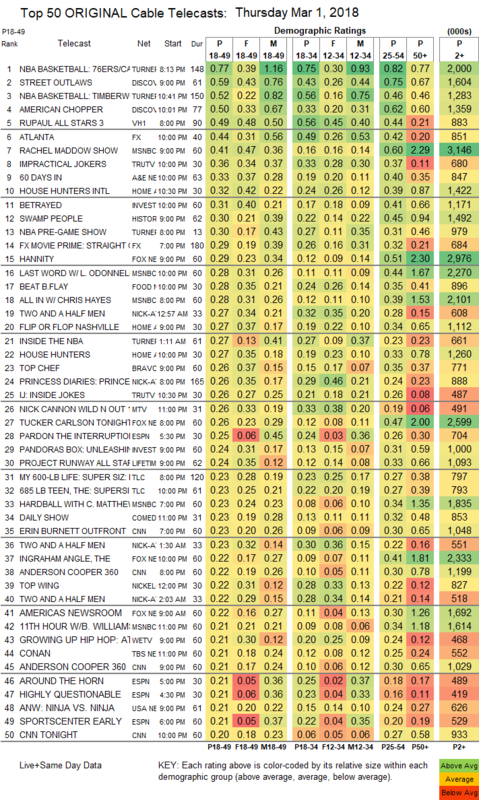 Discovery had the #2/#4 slots with STREET OUTLAWS at 0.59 and the premiere of AMERICAN CHOPPER at 0.50. VH1’s RUPAUL’S ALL STARS jumped 0.11 to 0.49. MSNBC’s RACHEL MADDOW SHOW had another big night at 0.41/0.60/3.1M, well over Fox News’s HANNITY at 0.29/0.51/3M and CNN’s ANDERSON COOPER 360 at 0.22/0.30/1.2M. On Tru, IMPRACTICAL JOKERS rose 0.07 to 0.29, and INSIDE JOKES.was up 0.05 to 0.26 A&E’s 60 DAYS IN dipped 0.03 to 0.33. On HGTV, HOUSE HUNTERS INTL gained 0.07 to 0.32, FLIP OR FLOP lost 0.03 to 0.27, and HOUSE HUNTERS ticked up to 0.27. On ID, BETRAYED was steady at 0.31, and PANDORA’S BOX was down 0.02 to 0.24. History’s SWAMP PEOPLE ticked down to 0.30. Food Network’s BEAT BOBBY FLAY ticked up to 0.28. 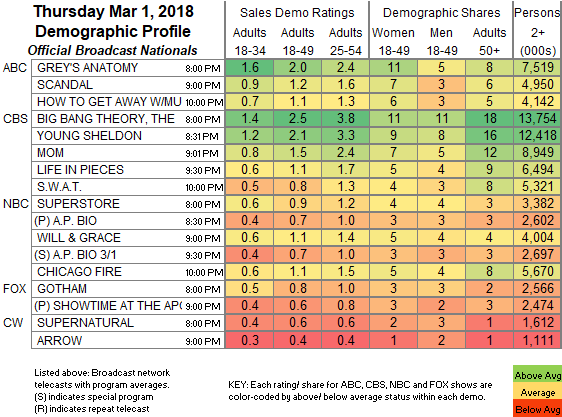 Bravo’s TOP CHEF gained 0.01 to 0.26. MTV’s WILD N OUT rose 0.07 to 0.26. On Lifetime, PROJECT RUNWAY grew by 0.03 to 0.24. USA’s NINJA VS NINJA premiered at 0.21. We’s GROWING UP HIP-HOP held at 0.21. Paramount’s LIP SYNC BATTLE fell 0.07 to 0.20. POP’s IMPACT WRESTLING gained 0.04 to 0.10. Freeform’s BEYOND returned from a week off at 0.09. CMT’s MUSIC CITY premiered at 0.08. IFC’s PORTLANDIA ticked down to 0.03/100K.